While hiking throughout Cypress Hills Interprovincial Park in Alberta, Canada, there are some spectacular viewpoints where you can appreciate the scenery of the region and admire the layout of the land. From the Reesor Lake viewpoint, visitors overlook Reesor Lake and the landscape of the provincial park. On the Alberta part of Cypress Hills Interprovincial Park, there are three lakes, one being the Reesor and the other two named Elkwater and Spruce Coulee Reservoir. On the Saskatchewan side of the park, the Harris, Adams and Coulee are three other lakes located throughout the park. Overview of Cypress Hills Interprovincial Park and Reesor Lake seen from the Reesor Lake Viewpoint, Alberta, Canada. 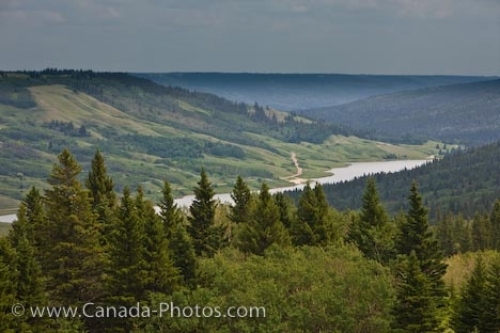 Photo of the beautiful scenery of Cypress Hills Interprovincial Park and Reesor Lake in Alberta from a viewpoint.